Prepping for ROUND TWO of the #plantPOWER Challenge. Hi all! So glad you’ve enjoyed the last couple of weeks of honest posts. I opened up about my deeper struggle with changes. We discussed the facts behind FATS. We talked about some common healthy eating “fears”. Jen shared her amazing weight loss story. I truly believe that honesty is the best way to make a connection with others. I am so happy that I felt I could open up honestly on my blog & reveal some stories that I had yet to talk about. You all are an amazing support group & I appreciate all of your kind words & comments on each & every post! 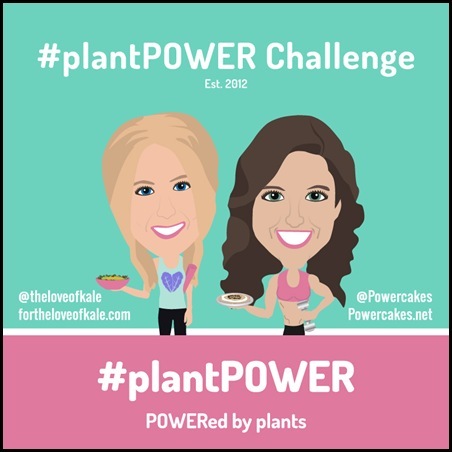 With that being said…Heather & I are moving forward into our SECOND PLANT POWER CHALLENGE! Can you believe that it’s almost February? I swear I was just in my brother’s December wedding. Heather & I have been working very hard since our last challenge in October. We really want to make this challenge special for those who participate and for those who are just reading along! 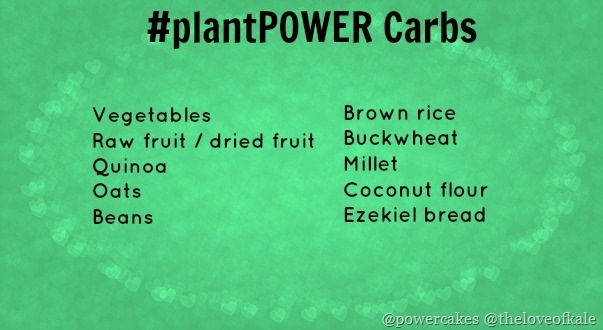 Either way, we love that you read the posts, tweet at us, e-mail us images, or post pictures to Instagram with your favorite #plantPOWER meals & products! Here is a video from our first challenge where we explain the meaning behind it. Now, we’ve said this before & we’ll say it again – this is NOT to make you be 100% Vegan. I always say BE TRUE TO YOU because I believe that we don’t need to fall under any certain “category” to make everyone happy. I eat the way that makes ME feel better & I honestly can tell you that 10 years of my stomach issues have almost gone away now that I’ve been eating mostly plant based. I say mostly because every now & then I eat sea food or feta cheese because I want to. I’ve found that when I eat this in moderation it’s easier on my digestion rather than eating on a daily basis. You can see my testimonials from the first challenge here. 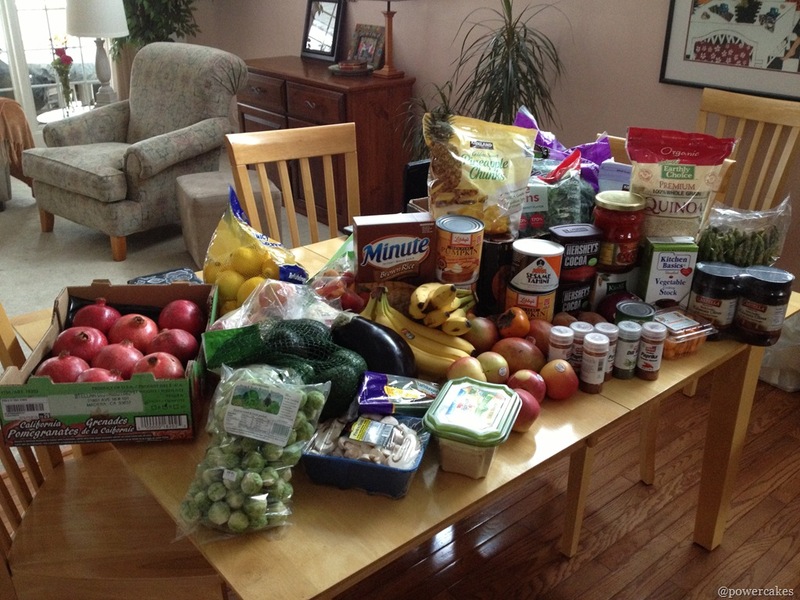 For the last challenge, we went over some great groceries to enjoy during this challenge & to enjoy always! We’ve re-done our images (thanks to the lovely Heather) & wanted to share some lists of foods we love! Now, these aren’t the ONLY foods you can eat – again, BE TRUE TO YOU & enjoy the foods you’d like. We are not asking you to go 100% plant based – we are simply hoping that you join in and try out some new plant based ingredients – because honestly – more veggies in general can’t hurt you!! Here is the link to our first post about different plant power choices! So many to choose from! 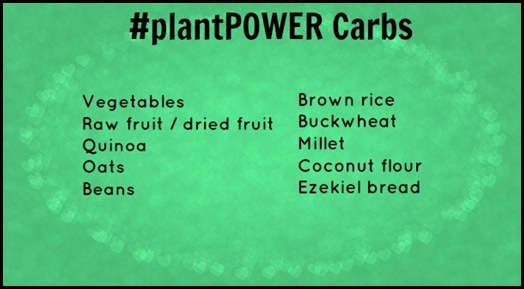 I truly don’t fear the carbs – CARBS ARE FUEL for our bodies! I usually have a serving with every one of my 3-4 meals that I eat a day! Onto my FAVORITE – FATS! I used to “fear” them but now I eat one with every one of my balanced meals! But the biggest question of all – dude, where do you get your protein? I then began to teach a whole lesson on plant based foods & why they are great for us! but, that doesn’t mean you can’t be TRUE TO YOU and enjoy it! You all know that I don’t count calories, but for the heck of it the other day I plugged my day of eats into my phone to see the amount of protein I was getting in a day. Looks pretty good to me! Now, I didn’t plug in all of my veggies & I may have missed a few things so my calories were probably higher – which is fine because I work out hard & need the fuel! 107g of protein is a good number of where I like to be – usually between 70-100g of protein is a good amount for my amount of being active. Remember, EVERYONE’s NEEDS ARE DIFFERENT! shares with us a little about protein with a sample day of eats here! Plant-based superstars-beans, lentils, peas, nuts, soy products, quinoa, leafy greens. Protein doesn’t equal flesh, it’s a macronutrient, available in all foods. Julieanna also shares a Plant Based Food Guide Pyramid as well to help! 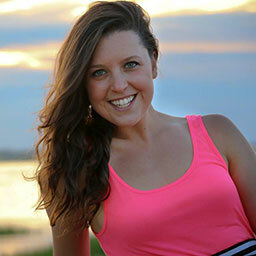 Speaking of Julieanna, did you know that she was featured on the Doctor Oz show? This is how I first saw her & I was hooked to her work ever since. She is so sweet & will be making an appearance during our #plantPOWER challenge & we are SO excited to have her. JUST WAIT until you see what she’s got planned! 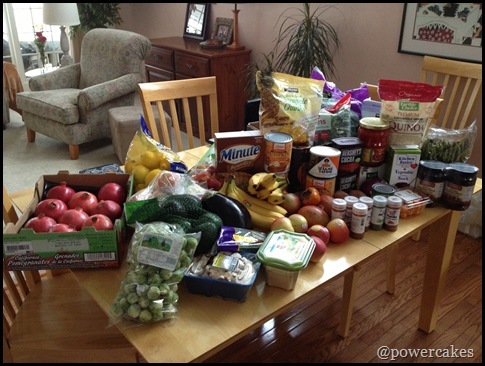 *Keep in mind, we buy for 3 people and our pantry needed some serious re-stocking! Brown rice & so many more!! We will be posting the calendar soon – but we can tell you that each day will be a different theme! All you’ve got to do is just follow along & tweet your images each day or leave comments on our posts! We have a bunch of giveaways throughout the month from some of our favorite companies as well. Will you be joining us!? I will definitely be joining you!! I read along with the last challenge, and thought it was awesome. I will definitely be “true to me”. I tend to eat vegetarian meals quite a bit, but still include meat and seafood in my diet as well. This is what has worked best for me. But no matter what, I try to keep my diet CLEAN and full of WHOLE foods! Can’t wait! I’ll be joining in! I am new to your blog, but excited to follow along in this challenge! Bummed that I missed round 1. This is such an amazing idea, you can bet I’m all in for round 2! SO SO excited for this challenge! I followed along round 1, but plan on participating more by posting pics and leaving more comments this time around! love it! of course i’ll be joining in! Awesome! I’ll be joining you this time. I missed the first plant power challenge so I’m happy to have another chance. I will be joining you for sure!! 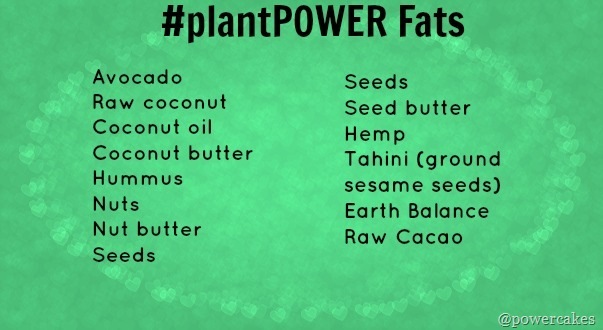 The last plantpower challenge helped me finally figure out what was causing my stomach pains so I’m totally on board!! Hey Kasey! What kind of (plant-based) protein powder do you use? Awesome! I found your site right after the last challenge so I’m excited to catch it this time around!!! 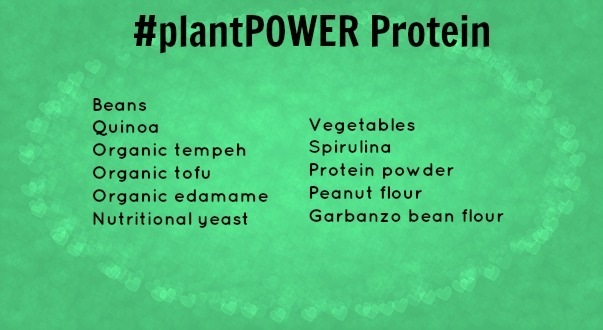 I’m definitely going to follow along, but instead of doing meatless mondays, I’m going to do meat-filled Mondays and make that my one non-vegetarian day I’m also leading a group through a month of trying to take small steps in building better habits, so hopefully some of them join me in PlantPower too! YAY!! So excited you’l join us Sara! I am going to try it out! It will be interesting to see how the family reacts! Oh! I just had a realization… This is all through twitter?!? Or can it be throu insta gram with the hash tags and tagging??? Whoops! Answered my own question! Instagram it is!! !